First imports of Beef Simmental were realised in 1993 from Canada. Other importation followed: from Denmark and Germany. Altogether with heifers were imported also many bulls for breeding. At the same time were introduced to the beef systems also Fleckvieh heifers from Germany and Austria. Since beginning of breeding, polled type of Simmental is preferred, but on other hand horned animals are not cut out. 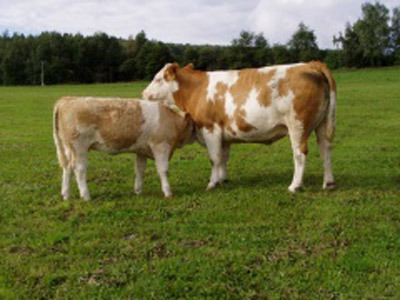 Concerning the strong interest in Beef Simmental and its legitimate continuation on cows of Czech dual-propose Simmental, the polled type is getting more popular. Czech population of Beef Simmental can be characterised as cattle with high size, good frame, high growth ability and good meat performance.